Go to Ebooks from Ebsco to find thousands of books on all types of topics. EBooks from Ebsco are like print books and can generally be read by one person at a time. Some titles can be simultaneously accessed by up to 4 users at a time. If a book is unavailable, you should try back in a little while. Many of these books can be downloaded to eReaders such as the Nook and Kobo (other mobile devices might be a bit problematic). To download and eBook, you need to first create an Ebsco account (which is free) and the eReader you are downloading the eBook to must have Adobe Digital Editions installed (freely availabe on the Adobe website at http://www.adobe.com/products/digital-editions/download.html). 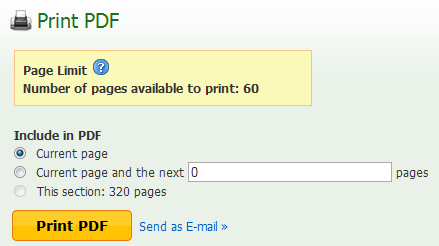 After you have created a free Ebsco account and installed Adobe Digital Editions, select the icon on the left of the screen "Download This Ebook". As you can see, you can print up to 60 pages at a time. Choose Current Page if you only want the one page or look through the pdf file and determine how many pages you'd like to print and select Current page and the next and enter the number of pages you'd like to print. Then click on the bright yellow Print button.